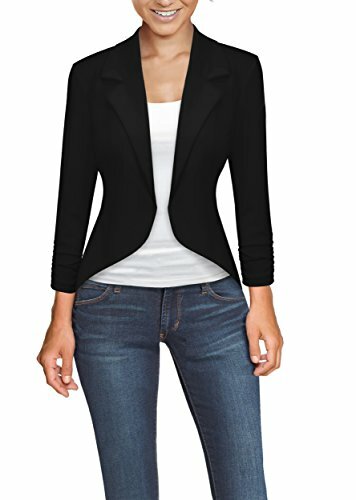 HyBrid & Company Womens Casual Work High Low Blazer Jacket JK45590 1073T Black Medium by HyBrid & Company at Mas Fashion. MPN: JK45590-1073T-BLACK-M. Hurry! Limited time offer. Offer valid only while supplies last. Versatile casual and office Open-Front blazer jacket featuring high low design, perfect match for a pencil skirt. suitable for work or everyday. Versatile casual and office Open-Front blazer jacket featuring high low design, perfect match for a pencil skirt. suitable for work or everyday. Designed to be wear even in hotter months in spring and summer, as well as year round. When you purchase 3 or more. Enter code 7ZC2WXIG at checkout to receive 10% OFF! This is not just an ordinary office blazer jacket. Made by Premium Ponty 4 Way Stretch Fabric, soft and so comfortable you could wear it anywhere! Fame Fashion House is the only authorized seller of HyBrid & Company product. Do not buy from any other sellers as their product are counterfeit & not held to the high standard that we produce. If you have any questions about this product by HyBrid & Company, contact us by completing and submitting the form below. If you are looking for a specif part number, please include it with your message.